Next Post To Cuff Your Pants or Not? I would like to see some pictures here. I can verbally follow this process. I second that motion, how about some pics……. Philipp, thank for your comments. I have always had problems shortening shirt sleeves effectively, and in fact making cuffs narrower. Any recommendations on how to do this? I’m sure readers would be interested. B-rad and Dejvid, I will try and come up with some form of illustration, but it may have to be a dodgy sketch of my own as I have not seen anything effective published on this. If anyone has, please tell me. Great article on something I want to try, but trying to visualize “Iron that patch flat and then fold the material above and below, pulling the material away gradually so it forms a crescent.” is as tough for me as I’m sure trying to figure out how to describe that in text was for you. Please do a video, put it on Youtube and post the link here! Glad to see someone else is exploring the possibilities of the sewing machine. I had several very bad experiences with different tailors/seamstresses and finally decided that I’d had enough of them. I rationalized, if they were skilled and did a terrible job, presumably from lack of attention to detail, then I could produce at least the same results, being unskilled but maintaining great attention to detail. And indeed, my hypothesis was correct. However, I don’t like darting. 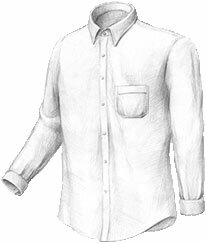 I like the simplicity of the men’s shirt; for me, darts at best add clutter, like cuffs and pleats, and at worst can seem to be drawing too much from women’s style, where darted blouses are the norm. Determined to find a solution, I haphazardly ripped out the side seams from one of my shirts, leaving myself no choice but to figure it out or throw the shirt away. For my first attempt, I actually tried to reproduce the commercial folded over seam that you can see on most shirts. A frustrating and painful process. After that, I discovered the wondrous flat-felled seam, which from the right side looks indistinguishable from the commercial seam, but is infinitely easier to produce at home. And now, in possession of a felling foot, a presser foot expressly designed to assist in producing these seams, I’ve gone mad with power. No poorly fitted shirt in my wardrobe is safe. That baggy pair of chinos is next on the chopping block. As you mentioned, some would probably scoff at the idea of tailoring your own clothes at home, but I find it quite practical. There already being a sewing machine at my disposal, it has saved me quite a bit of change in tailor’s bills. And, to return to my comment at the start, when you’re tailoring your own clothes, your attention to detail is quite high, so the results are likely to be, at the very least, wearable.